Home > Campus News > MET presents ‘T.R .A .S .H’ Festival! MET Rishikul Vidyalaya in association with The Energy and Resources Institute (TERI) had hosted a three day festival ‘T.R.A.S.H’ (Thinking, Reflecting and Acting for a Sustainable Habitat) on January 13 – 15, 2011. 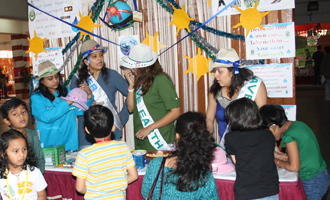 This unique festival promoted and demonstrated the concept of Sustainable Life Styles and targets not just students and teachers but reaches out to parents and the community at large.